My favourite cg Disney/Pixar film of all time. The whole film is so well textured and lit. This will be amazing to try and match it. Hey guys there are a lot of great images here. And thanks a lot kanooshka, for the feedback I really . This time i’m trying with some adjustments to the materials and some textures… I know I have a LOT to work with the textures but you know, this is a wip. @at2142 - Great start with the water! Your image has a lot of black tones in it, try to fill those in with rich colors, so that the darkest parts of the image are the most saturated, instead of the least saturated. @runejw -That’s some terrific texturing there! Work on dividing up the areas so different alcoves and corners and parts of the kitchen have different colors, instead of the same hue dominating the whole place. There’s something strange going on in the copper pots, where the self-reflection on interiors are going a very deep red, I hope that isn’t a problem with the raytracing. If you did skip the raytracing, you’d probably need reflection occlusion on the env cubes at least - but if you can get frames done in under 10 minutes, who really cares? Hi this is my 3rd update, I change again the compositon, I like it more like this one. I adjust the lights and I take away the shaders, now Im going to start to play with them…Thanks for the advices! PD: Thanks a lot Kanooshka for the feedback! very nice this challenge !!! 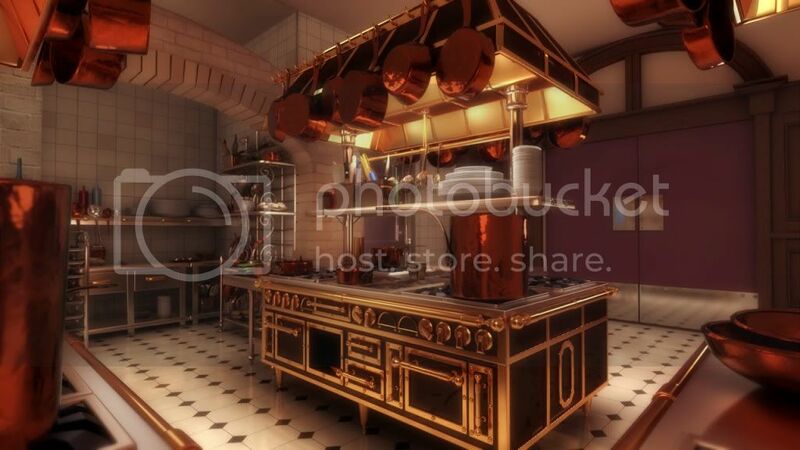 Anyone is using 3D STUDIO MAX for doing that lighting ? i’ve found an other QTVR movie at the Disney site that might be useful for reference purposes. 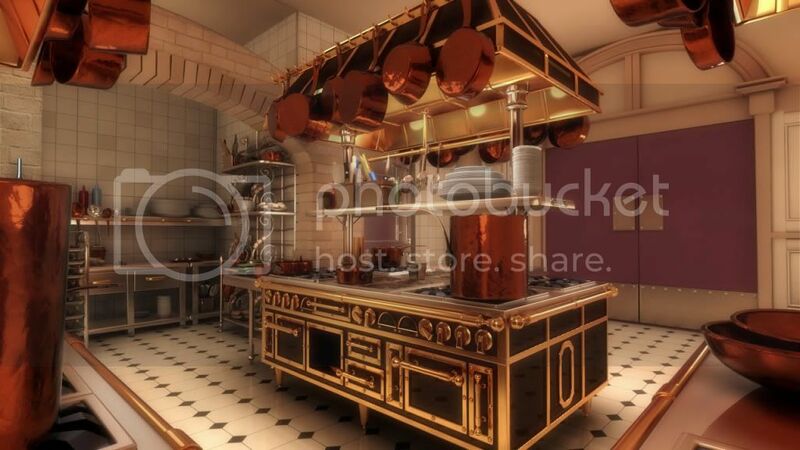 Things that i’m still looking at are texturing of props in general, right now my copper pots and pans just have a procedural texture added to break up the perfectly smooth surface it had earlier, so those will get treated as well as general things like the dials on the oven, stove tops etc. A bit of grunge on the floor will also be added.The crisp shadow of the pans cam right foreground will also get softened. There are also some funky gaps in the roof’s polys that are occuring, i’ll have to check out that geometry. I’m watching the movie again tonight to get clarity on how to treat the doorway and it’s wall section texturally and what colours they are. I’m using Lightwave 10.1 for this and Fusion 6 for compositing. This is my test render it’s still in progress but i would be happy about some cnc. Hi guys, here’s my latest version of the scene. Did upgrades to overall lighting and colour treatment, will be hitting the texturing tomorrow. loicV, you should really keep it up, you’re getting the foundations of your reference down. niravsheth: I really like your progress! 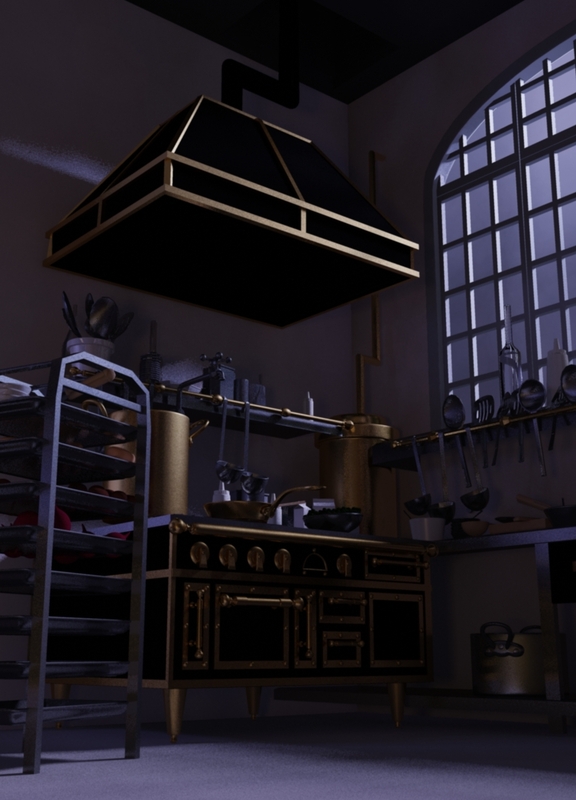 Good job Cre8, your room’s textures match the reference kitchen really nicely. I’ve worked a bit more on getting my Image closer to the reference in terms of specular balance, lights and darks etc. There are still some things I would like to improve on, but haven’t quite figured out the best way to go about it. niravsheth: Every image you’re improving more and more. I hope you don’t mind how picky I’m getting with these critiques. Since they’re not a focus, the items on the right of the shelf could do without the rim, or at least a much more subtle one. it’s ok if they don’t pop from the background too much. The stove burners could use some more attention. The burners are a much more rough surface with more diffuse and very little specular reflection. Also the light from the burner could be much more red and less saturated. How close are you trying to match the reference? There are more suggestions but I’m not sure if you’re trying to match it as exact as possible. Have been inactive since 2 weeks now. Was caught up in the middle of other projects. Kanooshka: Thank you for the feedback. I really don’t mind the nib-picking, for I am sure it will improve my work and eye. So please continue I will do the necessary changes mentioned by you, soon, and will post a updated version. As much as I would like to match the exact way, I am afraid I wont be able to. Meantime, here is something which I was working on yesterday. Would appreciate if you could let me know which color scheme I should go with. Also, any tips and tricks to render Shave & haircut with Mental ray would be highly appreciated. I intend to pose this character in the scene soon. Appreciate all the kind words from FED, Nitz3D, Jobim, kvdo and others. kvdo: Wow, excellent update! I really love how you have nailed down the color and lighting overall. I guess, a few more touches and you should be golden. Love the textures too! Simply amazing. However, I notice one thing. Your reflections below the stove (black part) are too sharp. Try to blur them so that it matches accordingly. It will increase your render time, but will be worth it. Also, the table on right is receiving more light as compared to the stove. Lowering that would help further. Keep going! Cre8: Coming along nicely. I guess, the depth blur may be a little too high, not sure though. Nice soft reflections on the floor. Ceiling could use, just a touch, some more darkening. Keep it up. FeD: Nice updated render! Looks fantastic! For keeping the viewer’s eye focused at one spot, I would lower the intensity of the light in the foreground stove. Matching the black material of the burners body would help immensely. FredFrid: Cool looking render! You have a nice soft feel about the lighting which is great. Not sure if you are using SSS, but some objects feels too waxy. Great composition. Keep going. 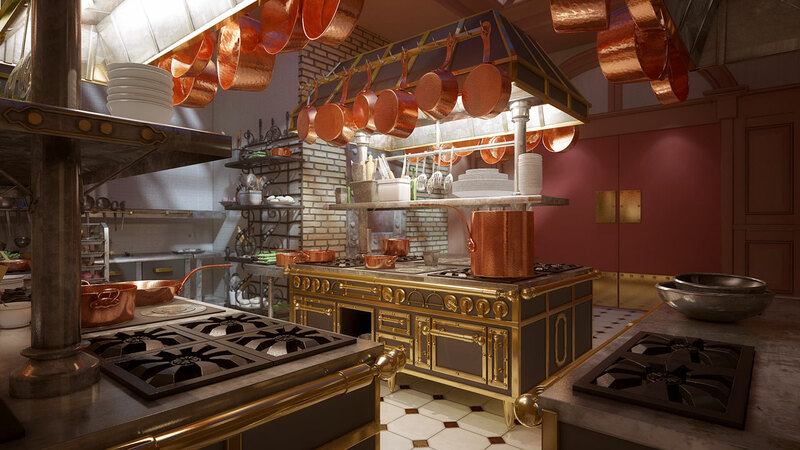 Tronkyfan: Ahh, great texturing details everywhere, specially the pan. Love the steam. Great start! Would love to see your reference image. Other’s are doing great as well. Sorry, don’t have much time on my hands to critic everyone. Sorry I’ve fallen behind in the feedback. Just got engaged this past weekend so I’ve been busy! niravsheth: I’d go with the blue one, it will pop out more from your warmer environment. kvdo: Look great! You’re really capturing the feel of the reference image. You’re really nailing most of materials in the scene. The bottles could use some more falloff on their reflection. Glass tends to have a fairly high fresnel effect. The burners on the stove are going a bit too black and could use some brighter diffuse illumination. The floor could use some more variation in the illumination. If you look at the reference there are lit areas around each stove but an area of shadow between each area. The vegetables could use some more sub surface scattering, there’s a lot of areas that are going completely black. Again great work! Cre8: Good work! Your texturing is very strong, and your materials are working nicely as well. The pots and pans are getting pretty dark, especially on the insides of them. I’m not sure if this is a trace depth issue or their reflectivity just needs to be increased. FeD: Great work! You have a very solid image overall. The color of the stove trim doesn’t feel as integrated as it could. I think if you added some red to the reflection color it could bright it all together a little more. The burner on the bottom right is looking a little to dark, especially compared to the burners to the left. The ceiling and upper walls could use some darkening, it would also help frame the image. FredFrid: Good start. I think you could push the Bokeh a little further so that the stove is even more the focus. The green bottles seem like they’re glowing. Make sure they don’t have a very high diffuse value. The left wall is getting a little too dark. I also think the foreground could use a different color for the key lighting, that way it can separate the foreground from the background a little more. tronkyfran: Nice work so far. Some areas of the scene are getting a bit to dark. The main body of the stove could use a small amount of a reflection from off the screen. You have very bright highlights and dim highlights but the image is lacking mid-tone highlights. You may be able to reduce some of those bright highlights and get those midtones. Jeloh: Glad to see you fixed that wall that looked like it was glowing. The fog in the image still seems a little strong and needs to follow the lighting in the scene a little better. If it’s a dark part of the room, the fog would be pretty dark as well. The fog also washes out the image and you lose a lot of the contrast. The floor underneath the stoves could get much darker. I’m not sure if it’s the fog, but the walls underneath the stove and the counters in the alcove could use more shadows.